The story of a woman who helped to bring down a government. Jeanne St. Remy de Valois has one ambition -- to restore the position and fortunes of her family. Born in pre-revolutionary France, Jeanne's fate was not unusual in monarchist states. A wrong move, an incorrect alliance, and a family could be thrown to the streets or the jails stripped of their lands, their titles, their 'honour'. Come to adulthood, the beautiful Jeanne is living in an age where women had influence through their political salons, and could gain influence through effective bed-hopping. She sets out to redeem her family. 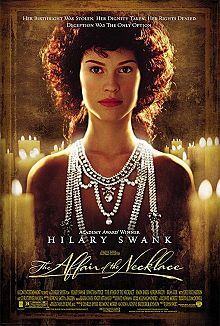 Based on the true story of Marie Antoinette's Diamond Necklace, The Affair of the Necklace is the story of one of the triggers for the downfall of the French aristocracy. Using as her weapons her knowledge of the ambitions and lusts of courtiers, notably the cardinal, she engineers an embarrassing situation for the queen in hopes that she can gain the leverage to demand her family's return to favour. Not the usual costume drama, this film has a female protagonist who is the villain of the piece. She is not looking for a hero to rescue her and restore her position, but instead sees everyone as a possible pawn. Beautifully photographed, swiftly told, something above the pack when it comes to tales of the French Revolution and the lavish courts that preceded it.